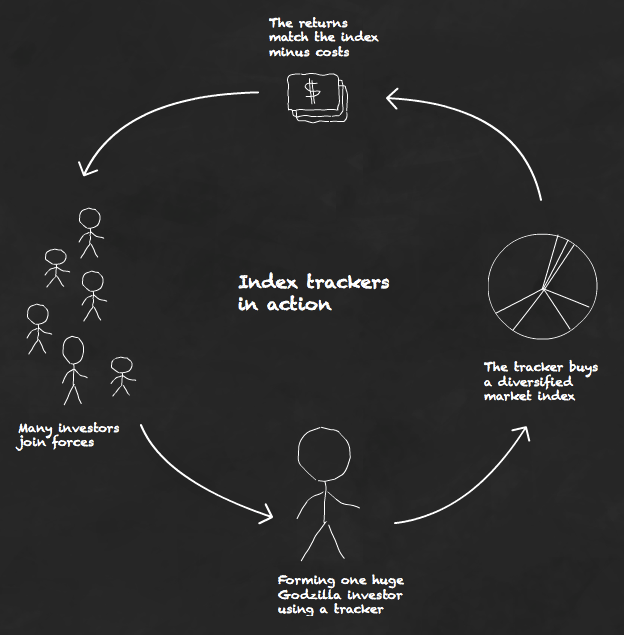 Index trackers are the investment vehicle  of choice for ordinary Joe investors. Why? Because index trackers provide a low cost way to build a diversified portfolio that will outperform  the average active investor. Index trackers come highly recommended  by some of the biggest names in investing. Like other funds, tracker funds enable lots of investors to club together to increase their buying power. For example, trackers make it possible to invest in all the world’s stock markets via just one global index fund . Trackers  are therefore a good way for everyday investors to get into the stock market without exposing themselves to the dangers of individual stock-picking. Risks and costs are reduced thanks to the scale and diversity of the fund. And while you’ll never beat the market’s performance with a tracker, you won’t lag it by much, either. Most funds have an aim. The aim of a tracker fund is to reproduce the returns of a specific market index . An index is a basket of securities (such as shares or bonds) that is used to represent a particular segment of the market. An index is a bit like the financial equivalent of a poll. The body behind some particular index regularly surveys a sample of the market to get a snapshot of the bigger picture. There are many weird and wonderful indices out there, from the All-Peru index to the Volatility Arbitrage index. But virtually all of us only need to concern ourselves with the biggest ones around. The market you want to track (e.g. UK domestic equity). Which indices track that market, and how the indices differ. You can then make an informed choice about which tracker to go for. For example, UK equity is covered by a number of indices, the two most popular being the FTSE 100 and the FTSE All-Share. The FTSE 100 tracks the 100 largest listed UK firms, and covers roughly 81% of the market1 . The FTSE All-Share covers 98% of the market; it bundles together the FTSE 100, FTSE 250 and FTSE Small Cap indices. So if you want the most diversified index, you’d pick the All-Share. If you only cared about Britain’s biggest companies, you’d pick the FTSE 100. You can find out which index a tracker mimics by reading its fund factsheet. For more about the indices, visit major providers like FTSE  and MSCI . A tracker’s job is to deliver the return of its index. It usually does this by holding stocks (or other assets) in proportion to their presence in the index. Some trackers will hold the lot, some only a sample, and yet others will replicate index returns using complicated swap deals 2 . The key point is that trackers don’t try to pick the winners. They don’t market time. They just plod along tracking the index, handing over the returns due from the performance of its component securities. By its very nature, a tracker will never hit three cherries on the fruit machine. It will never turn in a stellar index-trouncing result. Its task is just to replicate the index. In fact, a tracker will usually undershoot its benchmark due to fund costs. But a tracker’s limited ambition makes it cheap to run – and it’s because they are cheap  that most index trackers outperform  more expensive active funds over the long term. Index funds – Index funds are the simplest tracker type available, and the most suitable for small investors contributing monthly sums. The majority of these are now structured as Open Ended Investment Companies (OEIC), while a few are unit trusts. The US equivalent is called a mutual fund. Exchange Traded Funds (ETFs) – These are basically index funds wrapped up in a share that’s quoted on the stock market, which you buy and sell like any other share. Buying ETFs therefore incurs trading costs  that ramp up the expenses for small investors. There is though a far greater choice of ETFs than index funds – an ETF may be the only way you can get exposure to some markets. There is a third type known as an investment trust tracker. These are few and far between and are generally pricier than index funds or ETFs , so aren’t worth worrying about3 . You can read more about the different types of tracker .